Interdesigner Software > Products > Shutdown Manager and Tools ! What is Shutdown Manager and Tools? Is an application that helps to program a Shutdown, Restart, Logoff, Standby or Hibernate event, with many add-ons and Tools. Can be scheduled to perform different tasks, with Power Monitor, Screen Capturer, Windows management, Fast File Finder, Connect to Remote Shutdown Managers via Network, etc. Automating tasks as easy as 1-2-3! - Hosts Names / IP's allowed to work with Shutdown Manager installed on a remote computer. Shutdown Manager allow you to specify a time to wait before starting the process (Shutdown, Restart, Logoff, Standby or Hibernate), but also you can specify if Shutdown Manager must wait for a Window (another program) to close or change it's Title (caption) before start countdown. This means, if you use this option, that you can select this option if you want Shutdown Manager to automatically start a Shutdown with Power Off just after your download is completed, or your database task is finished, or whatever you need to specify as a Window be closed or it's title change. Why should I use Shutdown Manager and Tools? How many times did you download a program that wasn't even worth a penny? We ensure you that Shutdown Manager is worth your time, But most important: saves you time. 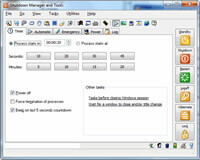 Create Automatic Events to: Shutdown, Restart, Logoff, Standby, Hibernate, Lock Workstation, Run Tasks before Windows close, Take Screen shots, Emergency Shutdown, Notes Reminder, Run other programs, Close other windows / programs, Exit Shutdown Manager and Tools, Shutdown remote computers using NT4, Windows 2000, Windows XP, Windows 2003 or better. Quick Capture to clipboard or file, of any region of your Desktop (with loaded applications / windows). Estimated battery duration and charge time (for battery operated computers). Perform cleaning tasks of unnecessary files that slow down your computer! Remove unnecessary History, temporary files, etc. View your clipboard's content easy, with Clipboard Viewer. Quick save Images and Text with just one click! Animate your Start button, easy! Windows 8, Windows 7, Win2008, WinVista, Win2003, WinXP, Win2000, WinNT, WinMe, Win98SE, Win98, Win95.